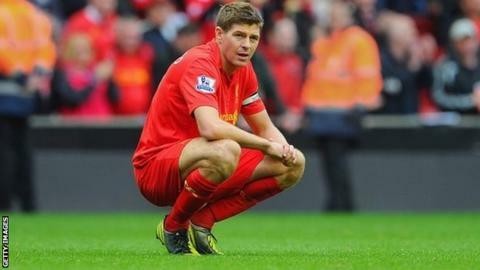 Liverpool captain Steven Gerrard says it will take a miracle for the club to win the Premier League before he retires from football. The Reds, who were last crowned league champions in 1990, are 14th after a mixed start to the new season. "It'll be a miracle if we win the title before I finish," Gerrard, 32, told The Sunday Times newspaper. "I say that because of my age and the situation with rivalries. The league has become more difficult to win." Gerrard believes the emergence of teams such as Manchester City, who won the title last season, will make his dream almost impossible. He said: "There's not just [Manchester] United and Arsenal now but [Manchester] City, Chelsea and Tottenham. Newcastle are coming as well. "We were eighth last year. If this season goes well, we get a bit of luck, improve, we have a 50-50 chance of being in the top four. That's being realistic. It's achievable. "Even if we do sneak into the top four, I'll be 33 at the end of the season, so that's why it'll be a miracle if we win the title before I finish. "But I'll keep fighting. I'll keep trying and see what happens." Gerrard, who was born on Merseyside, joined Liverpool's academy aged nine and signed a professional contract with the club in 1997 before making his senior debut the following year as a second-half substitute against Blackburn. The England captain has now played for Liverpool for the last 14 years. His current contract expires at the end of next season but the England midfielder is hopeful he can emulate United midfielders Ryan Giggs and Paul Scholes by prolonging his career. "I think I can play at this level for quite a while," Gerrard added. "I'm not looking for a new contract but I'm hoping next year will not be my last. I'll know when I'm ready to go. "It's getting more difficult for older players. It shows how well Giggs and Scholes have done. "You need a manager who'll play you at the right times - which is what Brendan Rodgers is doing with myself now." Under the new manager, Liverpool ended their winless Premier League run this season with a thumping 5-2 away win over Norwich on Saturday. Rodgers is still moulding his team and favours a "keep-ball" approach but, from what Gerrard has seen so far, the midfielder believes the former Swansea manager is on the right path to forging a team capable of winning that elusive title. "We're on the edge of becoming a good team," he added. "Teams are going to struggle against our style. "The kids coming through are very exciting. Raheem Sterling is incredible. A lot of people want to take credit but it has to be given to Brendan."